The Carroll Street Bridge, built in 1888-89, remains a symbol of the industrial past of the Gowanus Canal and the ongoing vitality of the surrounding communities. It is a retractile bridge, which rolls back horizontally on wheels set on steel rails, to allow shipping to pass. 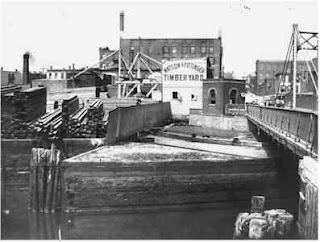 In 1887, the wooden bridge that had been built when the Canal was opened was shut down because of deterioration. Engineers from the Brooklyn Department of Public Works decided to build a new bridge rather than rehabilitate the old structure. A dispute followed over what kind of bridge should be built. Robert VanBuren, the Department's Chief Engineer, and George Ingram, the Assistant Engineer, favored the construction of a steel retractile bridge. According to the landmark designation report by Jay Shockley, the wooden deck rested on two long-steel girders, the west halves of which were carried on rollers resting on three rails on the shore. It was drawn in and out by a cable running into a picturesque little brick engine house on the west side of the canal. The bridge would slowly slide back, diagonally, until it was next to the roadway on the western side, opening a channel 36-feet wide. The trapezoid-shaped bridge is 107-feet long, and is one of the oldest bridges in New York City, and the oldest of four such bridges in the whole country. The other bridges are the Borden Avenue Bridge in Queens and two in Boston built in 1890’s. In 1986, the tracks were so out of alignment that the bridge had to be closed. The Landmarks Commission designated it as a City Landmark in 1987, calling it “rare and unusual”. From February through September 1989, NYC City Bridge workers completely reconstructed the Carroll Street Bridge, in time for its 100th birthday on September 9, 1989.